This is the first part of the guide, more focused on iPods (Shuffle, Nano, Classic). A guide on ‘syncing your iOS device with a new computer’ will be available soon, do check back! The computer with which you used to sync your iPod has died, and you can no longer sync it because a new computer won’t accept it. Or, you simply want to move your entire iTunes library to a new computer and eliminate the risk of losing everything when you sync with it. In short, you don’t want to lose data, but syncing the iPod with a new computer means all the content on your iPod will be overwritten with the content in that computer’s iTunes library. 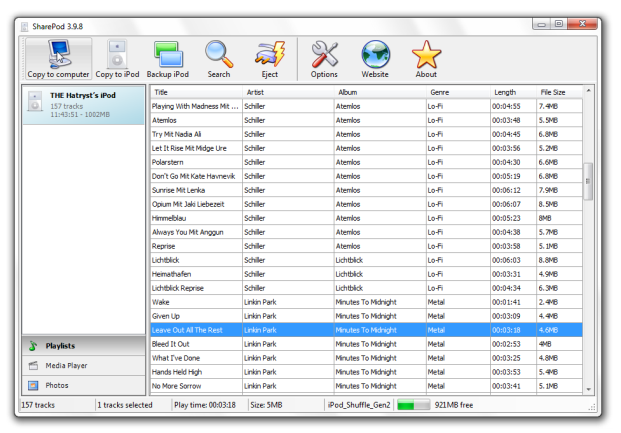 However, moving the iTunes library to another computer is not as difficult as it seems, since you have the original (host) computer up and running, so you can get stuff out of it. Apple has detailed instructions for that, so have a look at them. Just a matter of copying and pasting, it’s that simple. But syncing a lonely iPod with a new computer (without losing content already existing on the iPod) is not easy, and there’s no guideline provided by Apple whatsoever. That’s why it is recommended to have a backup of your computer, and doing so might save you a lot of hassle, kinda like what you’re probably going through right now! But all is not lost. In a nutshell, here’s what we’re going to do. Since you have all the content on your iPod, we can extract it from the iPod, import it into the new computer’s iTunes library, and sync with the new library. 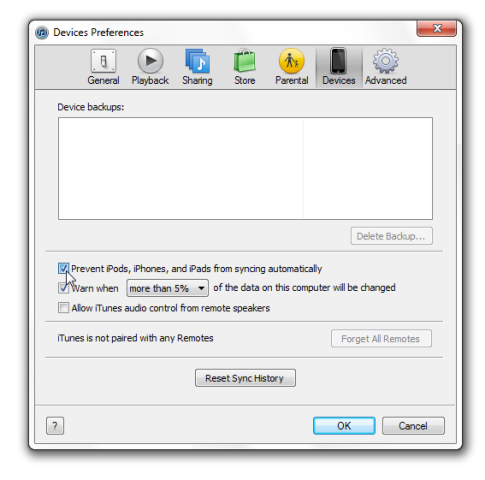 But if the music/content is purchased via iTunes, you can simply authorize the computer, and iTunes will instantly recognize the iPod. You might have different types of content on your iPod, depending upon the model. But retrieval of almost every type of data is possible. Whether it is music, playlists, photos, or videos, there’s a way to retrieve each type of content. Once you’re on the new computer, install iTunes on it. Once installed, open iTunes, navigate to iTunes preferences (iTunes> Preferences on a Mac, or Edit> Preferences on Windows). Click the Devices button and make sure ‘Prevent iPods, iPhones, and iPads from syncing automatically’ is checked. This is our first approach. In case all the media on your iPod was purchased and downloaded via iTunes, there’s a small, simple way of making the new computer accept the iPod and you can start syncing right away. Attach the iPod, open iTunes if it is not open already. Navigate to Store>Authorize Computer. A window will open asking for your Apple ID and Password. Enter the required information and click Authorize. You’ll see some activity in the information panel of iTunes. Once that’s done, navigate to File> Transfer Purchases from *your iPod’s name*. Now you’ll see all the content being transferred from the iPod to your computer, into the iTunes library. Once that’s finished, you can add/remove content, the iPod will be fully syncable with the new computer. No data lost! The second approach is for music that you didn’t download from iTunes. Instead, it is the music (or videos) that you probably ripped from CDs (or obtained from some other source). The method we discussed earlier won’t work for such media. If you have both iTunes-downloaded and ripped music, this method is more preferable, since it will recover everything. In such a case, third party utilities come to the rescue. There are several paid and free utilities for recovering music from a stranded iPod. We will have a look at the free ones. Let’s discuss Windows users first. SharePod is a very useful, free utility. Let’s get started with it. Plug in your iPod and open SharePod. Make sure iTunes is not running or it will prompt you to close it. Update: Looks like SharePod is no longer a free option. SharePod will readily detect the iPod and all the content on it, including songs and videos. However, in case of videos, you might not be able to identify whether the selected item is a music file or a video. That’s a drawback, but hey, firstly you’ve got free software doing all the hassle for you, and secondly, why would you want to be selective when your entire library is to be recovered from the iPod. Surely you’ll have to select everything, including videos. Once recovered, you can view the videos as well. 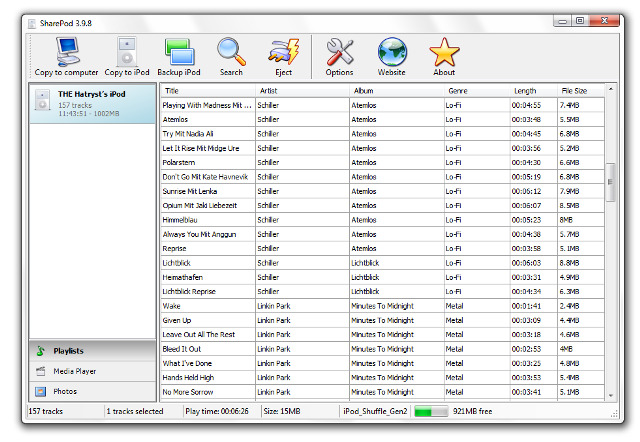 Select the files you want to copy from the iPod or press Ctrl+A to select everything in the list. Click Copy to Computer once you’ve selected the required media. SharePod will now ask you where to save the files. Specify a path, and you can also specify how the recovered media is to be categorized. You can select a different categorization format if you want to. Finally, click Ok to start extracting media from your iPod. Once the process is complete, you can navigate to the specified location to see all your music there. Now, all the content that was on your iPod is on your new computer as well. Now you can import it into iTunes, and let iTunes sync it to your iPod. However, if you didn’t uncheck ‘import my music to iTunes’, you’ll be surprised to see all your music in iTunes already, ready to go, no need to manually import music into your iTunes library. Nothing will be lost. Mac Users can use a free program called Senuti. Senuti is free for up to 1000 songs, but don’t worry if your collection is over 1000 songs. There was a time Senuti used to be free (and open-source), and you can find the older version here. It has almost the same interface (and features) as SharePod. 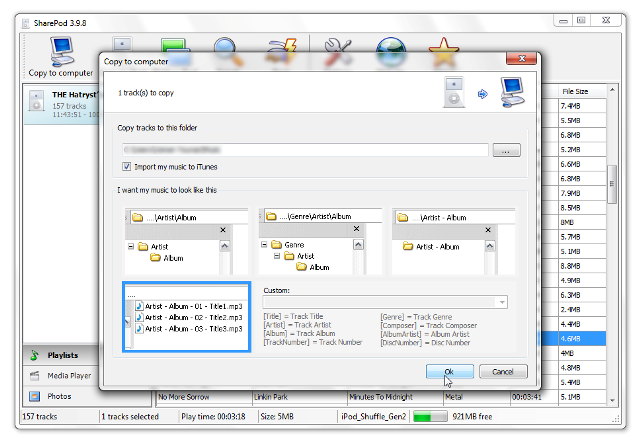 You just need to select all the files (Cmd+A), and click the ‘Transfer’ button. Just like SharePod, Senuti will transfer all the media (audio/video) from your iPod directly into your iTunes folder. However, the destination folder can be changed from the preferences panel. Here’s a small tutorial on using Senuti. 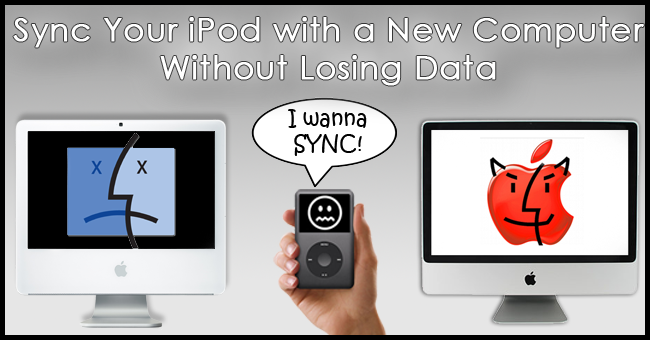 Once you’ve recovered all your required data, you can continue to sync your iPod with iTunes as you normally would. No hiccups, iTunes will accept you iPod for sure. But what’s the point of all this hassle? We just enabled the new computer to sync with your iPod. Now you can add/remove media, do whatever you want, because your iPod is now fully embraced by iTunes on the new computer. Congratulations! So, did we recover everything? Yes. Did we lose any data? Nope. Who said syncing your iPod with another computer was risky? It’s that easy! There are several other methods of achieving the same results, this guide only highlights a couple of those methods. Let us know in the comments if you have ideas on the same subject. And stay tuned for Part-2 of this guide, syncing an iOS device with another computer.